Ive been hosting servers for troop battles. 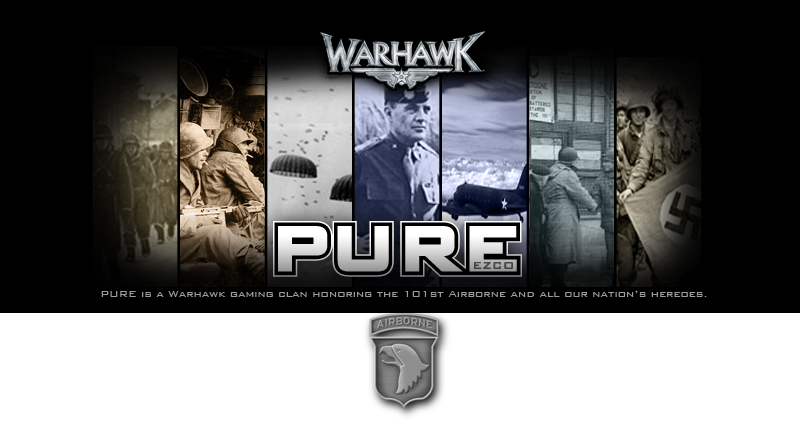 I clan restrict one side and put in the 101st Airborne EZCO so all EZCO troops can be on one side. This is the best way to learn how to play together as a team and against a real enemy. We have had some great battles and last night a clan match! I suggest if you set up a server do it this way, only thing "I" need to change is to put the idle kick ON. We have alot of active troops now, so the more servers the better. I can only hold 12, not sure how to get more (was told I have the highest internet aval in the area) had a few that tried to get in and could not, was full. See ya in the field, if there arent any good servers lets start some! Nice job Hallmark...just remember to be respectful of numbers. It is not sporting to have an overwelming number advantage. If you have 6 in and they only have 2, have 3 or 4 EZCO not spawn until the other team gets their numbers up. This may affect the idle setting as a few would get kicked waiting to spawn in to keep it fair. Remember to post your message that EZCO will only spawn in to even up numbers. Having the idle kick is not necessary if you can keep an eye out for idle players and kick them. It is just harder on the host to keep track. I should be able to get on later tonight after kids in bed. Look forward to gettin some hurt on. Thanks for hosting. Servers have been fun. Warn me next time we battle wildcats crew. My kdr was .45 for those five games. Oh ya always keeping it fair. We are doing a great job on the ground, need to work together on air. A bit weak and against air attack, working to knock enemy hawk down, with ground and air support. Match w/wildcats group was fun and good Gage of where we are strong and weak. He agreed to to help pilots w/Nflight. Wildcats group is up for playing again to. Riddleme4, Jbones498 and my area must have been a great Christmas, PS3s, XBox ect. because the local internet providers cannot handle all the users now. They are replacing the entire system, GOOD but it will not be completed until May! They did tell me that my service would be back to normal in a few days! Riddle and Jbones got a differant answer. We played against Pure clan last night and my ping was 250-550. But it was working for me for some reason. I was a monster and could kill anyone so not sure how or why but check out my KDR for some of the games. Normally a highping relates to bad gaming, not last night. I keep asking the PURE guys to let me know if it made the game lag and I would leave. The said every thing was fine. Did any of you notice it lagging or was I unusally hard to kill last night? Didn't seem laggy to me. My tow seemed to kill u just the same.